Carve your own downhill ski and snowboard path. Welcome to winter. Snow will soon strike where it does every year. But if you’re a skier, we doubt you’re complaining. 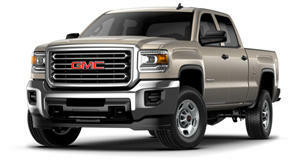 GMC figures that now is the ideal time to reveal its Sierra 2500HD All Mountain concept, described as “a one-of-a-kind snow-climbing machine.” Debuting right now at Vail Mountain, one look and you know this is no ordinary HD truck. Aside from its 6.6-liter turbo diesel V8 with 445 hp and 910 lb-ft of torque, in place of conventional wheels and tires there are Mattracks 150 Series Tracks. It’s literally a tank-truck for the snow. Other features include wheel well and underbody LED lights, snowboard racks, a 30-inch light bar, roll-up tonneau cover, and a six-speed automatic transmission. Inside, however, it’s all luxury. It’s the same interior you’ll find on the Sierra 250HD Denali, meaning it rivals the best Cadillac has to offer (if it had a pickup truck). By now you may be wondering whether the Sierra All Mountain concept could ever reach production, perhaps for ski resorts? Possibly, but GMC has yet to make anything official. For now though, the GMC Sierra All Mountain will be displayed for the winter season in Vail, Colorado at the mountain resort.